When was the last time you used a conference phone? Today? Yesterday? It probably hasn’t been more than a day or two. Voice conferencing is as ubiquitous as the traditional two-way telephone conversation—maybe even more so for many of today’s businesses. Conference calls in boardrooms, conference rooms, and even from our desktops, are critical to maintaining the pace of 21st century business. 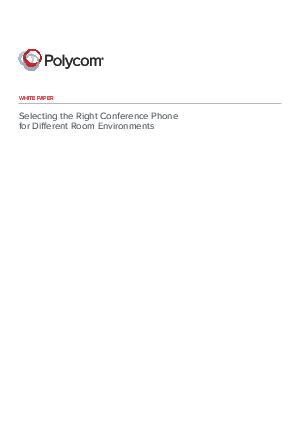 Polycom revolutionized the conference call experience in 1992 with the introduction of the original SoundStation® conference phone. The renowned, integrated triangular form and unprecedented voice clarity quickly became the standard of choice for boardrooms and conference rooms around the globe.